AN expat couple have been left ‘devastated’ after their town hall carried out a dramatic last-minute U-turn on plans to build a one-way system through their home. 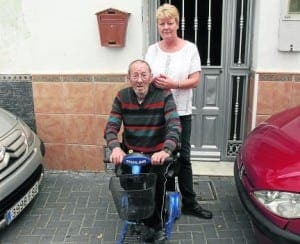 Disabled Brit John Gray and his wife Deborah’s home in Alhaurin el Grande is to be demolished to make way for the road. This is despite the town hall promising that the road would be diverted around their home, following an Olive Press story in April. The adjoining houses have already been demolished, leaving a ‘gateway’ into their home for opportunistic burglars, who have raided their home a number of times. So far around £600 worth of the Grays’ possessions have been stolen, including a power washer, kitchen appliances and tools. Retired bricklayer John Gray, 76, from Hertfordshire, uses a wheelchair due to a lung disease called COPD and is currently undergoing tests for suspected cancer. The couple are now being forced to take the €35,000 originally offered by the town hall, despite paying €66,000 for the two-bed, two-bathroom property in 2003. A town hall spokesman said that they had looked into alternatives but no written agreement was ever agreed. This is one of the many reasons for not buying property in Spain. You have zero protection against the government of this country just deciding to take your home. Foreigners are simply not wanted in Spain. Never purchase property in Spain. I agree with phil, never buy in spain we lost everything in spain lived there for 6 years. Irene, would that be a bar or an illegal property, you do not say. Of course, it is very difficult to know if a property is illegal until you get a letter or a visit from the police. Some people live in and sell properties that are illegal, and even the lawyers didn’t know either. 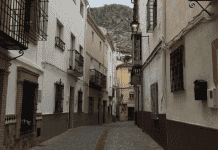 In Marbella this year a single decision rendered hundred of homes illegal in one swoop, when the local plan was overturned. The council should have provided another comparable home so they could go ahead with the one way system. So what kind of hoime can they buy with €35K – none at all. Now what will the Nasty party do to rectify this – nothing at all. They could of course ban any Spanish imports, this would resolve the situation imediately, same goes for all theother Brits who have faced this disgusting discrimination. Other nationalities have faced the same thing, these countries could adopt exactly the same tactics. If the Spanish had had to deal with kind of action in the past, it would have changed their thinking and action long ago. No one listens or pays heed to the weak. Stuart. As you well know the same things also happened in Britain and was called compulsory purchase. I recall whole streets of small houses with their own small back yards being purchased under the said scheme with the councils paying peanuts and owners offered the choice of a council high rise flat paying rents for some, the rest of their lives due to the compensation being insufficient to purchase another house. Fortunately my mother owned a few of the small houses in one street which enabled her to purchase a nice 4 bed house (coupled with a small mortgage) in a nice street with a large front and rear garden in Surbiton, Surrey. In-fact my sister still live there due to giving up a lucrative job to the ageing care of our mother and father and found it only fitting she should inherit the house. The houses in that street currently sell in the Million pound price range. (blast, I slipped up there). You are presupossinng that happened because they are Brits, thats not the case, even locals out of the “caste” have to cope with similar situations. Even with Franco there was more prevalence of the rule of the law, you asked for it. But Spanish have the advantage of knowing how to negotiate with the “caste’. Don´t know, ask them. If there´s to be a street, more propietors would be involved in the imminent domain. zabaot, it states a road is to be built. I don’t think this has anything to do with their nationality but I do think they should receive adequate compensation to re-house themselves. The sum of €35,000 is ridiculous, how are they supposed to re-house themselves with that? They might be able to afford a static caravan at a push but the site fees will be high. Have they got any legal representation? Unless they can land a pro bono favour Jane, they are snookered. A brief would end up swallowing even that derisory sum, with a dubious outcome.